Retired from her job as a medical social worker, Mary Wilson spearheaded what has become an annual tradition in Richmond. Richmond kicked off Black History Month in style on Friday, Feb. 1 at the Arts Centre. In an evening of entertainment and thought-provoking presentations, chief organizer, Mary Wilson, was never far from the sidelines but never in the spotlight. Wilson is clear that while she may have spearheaded this year’s program, as she has for the past three years, this initiator of the program quickly points out that she is but one of many who pitched in. After vibrant music from Checo and the VOC Sweet Soul Gospel Choir, was keynote speaker, Dr. Carole P. Christensen. She is the first person of African ancestry to be named head of the University of British Columbia’s School of Social Work. (While there, Christensen also appointed the first Indigenous professor of social work.) Before she retired from UBC, Christensen also started the East Vancouver Multicultural Centre which thrives to this day. The multilingual professor emeritus, Christensen learned Danish while living there as a Fulbright Scholar. She also fell in love with a Danish computer scientist. They married and moved to Montreal. After working at McGill, the family moved to Richmond to raise their family where Christensen took up her faculty position at UBC. Her talk, “Black in Canada: Acknowledging the Past and the Present to Envision the Future,” dispelled many myths. Christensen spoke of the 200 years of Black slavery in Canada: “In 1608, the first slave was sold in New France. In New Brunswick, Nova Scotia and Ontario, Blacks were legal chattel,” considered in the law as livestock. Christensen also spoke of objective and systemic forms of racism saying the last segregated schools closed in Ontario in 1965. Nova Scotia’s last one closed in 1983. Black identity is not mentioned.” Earlier, Sir James Douglas’s Black mother was brought to the audience’s attention. Something that, at the time, caused him to be discriminated against by the likes of Richard Clement Moody (after whom Port Moody is named) for Douglas’s racial heritage and his wife’s Indigenous heritage. Wilson she then closed the evening by thanking VanCity for supporting this event, as well as thanking those who also worked to make Richmond’s Black History Month a success: from the library–Wendy Jang, from city hall–Dorothy Jo, and the arts centre– Camyar Chaichian. 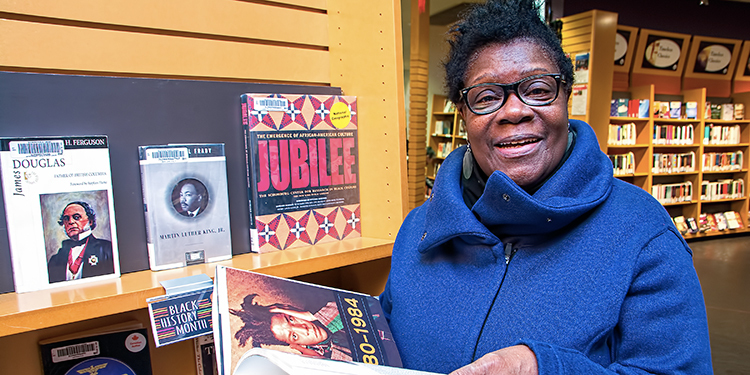 All events for Black History Month in Richmond are free of charge, including a month-long book exhibit at the main branch of the Richmond Public Library. Everyone is encouraged to attend.